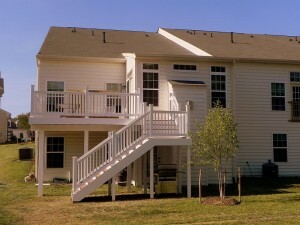 One of several new decks added in this Senior retirement community. If you have a growing family, and are looking for ways to expand your living space, one home improvement project that can really add value to your home is a new or revitalized deck. We will work with you or your landscape architect to design a deck or screened porch that you will love. 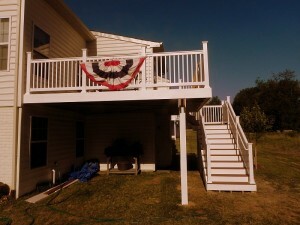 We can integrate your new deck with an existing sun room, spa, balcony, pool, waterfall or any other element you have. We will also help you pick the materials that will work best for your project including paints or stains. We will obtain the building permits as well as providing the necessary information needed to obtain HOA construction approvals. We work with the best materials in the market including Trex which is the material of choice for eco conscious homeowners. Trex is a composite low maintenance material that you don’t have to paint, it won’t fade, crack from insect or rodent infestation, pop up, swell or splinter. Best of all this material does not contribute to deforestation. We can also revitalize your existing deck using Pressure Treated Wood, Timbertech, Redwood, and Cedarwood.